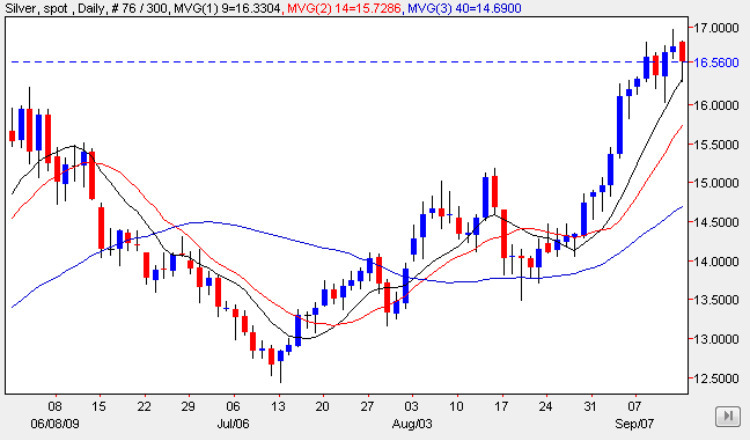 Spot silver prices ended yesterday’s trading session in an almost identical fashion to spot gold, marginally lower overall but with the candle having a deep lower wick which found support from the 9 day moving average, in much the same way as Thursday’s candle last week and suggesting that the bullish momentum still remains intact for the industrial commodity. The key difference between gold and silver is evidenced by the weekly silver chart where the commodity is now running into heavy congestion between the $16.50 price handle and $18.50 region, an area which was created over a period of many weeks early in 2008. Technically the weekly silver chart still remains bullish with silver prices trending higher in a nice channel with a series of higher highs and higher lows, but the congestion area outlined above will dictate the short term outcome for the commodity. Should gold push higher then this may be sufficient to provide the necessary momentum for silver prices to breach this region but if spot gold fails at the 4 figure level once again then this could result in a reversal for silver prices which may fail to breach this deep consolidation area.